These brave birds are weapons of war. Well, not these actual birds… they’re just models used for this photograph courtesy of a taxidermist. 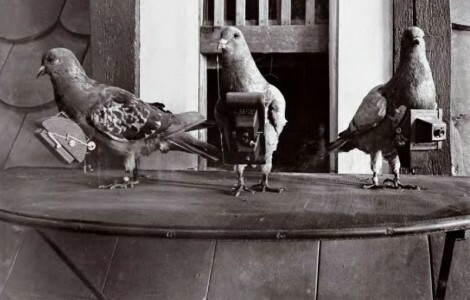 But their living relatives were used to take spy photographs during World War I. [Dr. Julius Neurbronner] didn’t suddenly jump into the field of avian photography. He, like his father before him, used homing pigeons to deliver prescription drugs in loads of up to 75 grams. This makes us wonder if the birds are ever used in modern drug running? The inspiration came when the doctor found out about subminiature cameras available at the turn of the twentieth century. Those cameras included a tiny roll of film, allowing for several images to be taken. He figured out a way to make a timer that used a pneumatic system to trigger the shutter in the camera. You can see a diagram of the timer mechanism here. The idea is that the birds will always be able to find their way home. So if you take them to a starting point that puts the enemy lines in between them and home base, they’ll fly over and get some juicy recon in the process. That’s pretty old school. But we’re still tying things onto birds these days. Here’s some modern tech that uses sun-up/sun-down to track travel habits.